The field of Community Engagement is booming in many jurisdictions and is being used to address many challenges and opportunities. A wide range of organizations have now recognized that engaging more fully and openly with their members, clients, constituents and/or stakeholder groups is not only valuable to their reputation and positive for their operations, but vital to the success of many of their decisions, strategies and initiatives. Furthermore, genuine engagement builds ongoing relationships, leadership capacity, and opportunities for collaborative action. Beyond the benefits noted above, this trend is driven by rising demands from individual community members and organized stakeholder groups for input and influence on the public-serving programs, policies and services provided by institutions at a time when additional resources are hard to come by for all, and allies are needed. This movement is also a logical response to the diverse challenges and make-up of the communities being served, and to the ongoing movement for community empowerment and asset-based community development (John Kretzmann, John P. McKnight First published: Winter 1996). 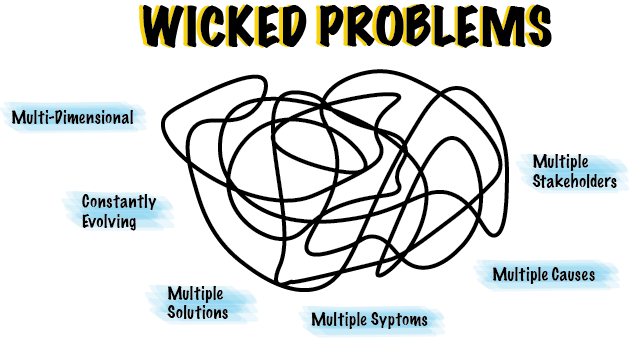 Finally, engagement suits the complexity of today’s many “wicked problems”, such as climate change, which cannot be solved by any one agency. — From “Wicked and Wise: How to Solve the World's Toughest Problems” by Alan Watkins and Ken Wilber, 2015, Urbane Publications. Benefits that organizations achieve through effective engagement include better decision-making and policy development, more responsive and effective service delivery, clear and direct feedback on agency performance, greater community support, aligned actions, more trust and understanding, better reputation and enhanced relationships. Tamarack’s research also shows that as citizens become more engaged in their communities, they move from being passive recipients to taking leadership and taking action. While preparing for, implementing and then responding to what they learned from their external engagement efforts, PSOs quickly see the need for internally-oriented change. The internal changes needed, although challenging to the organization, in turn further strengthen the capacity to respond and partner, and thus to continue to do high-quality external engagement and joint action. We thus argue that certain practices of external engagement and of internal development reinforce each other in an “infinity loop,” and that the success of this loop creates more strategic, responsive, and effective PSOs, as well as better social outcomes. High-quality, externally-oriented community engagement by PSOs is a complex process, but we feel that there are some core practices and typical phases that can be briefly described, and which need to be better understood. Below is a very high-level description of the process of high-quality Community Engagement, based on MODUS’s two decades of research and experience with engagement in a wide range of PSOs. This process is consistent with the work of Carolyn Lukensmeyer and other scholars in the field of Community Engagement who study “vertical engagement,” where power is not equally distributed but attempts to share power are being made by those who hold it. The engagement process begins when the Public-Serving Organization commits to opening up its decision-making processes on an important topic or initiative. The PSO identifies a specific issue, decision, service, program or policy as needing substantive input from a range of citizens or stakeholders. When that commitment is made, successful engagement becomes the responsibility of specific employees and members of management, with executive bodies providing ultimate oversight. Internal time and effort must then be spent by PSO employees (or additional capacity provided by contractors/consultants) preparing for external-facing engagement activities. Among other responsibilities, they clarify the agency’s need for engagement, the timeline for engagement and decision-making, fully describe the issue to be addressed, pose the appropriate questions to engage on, design a process to follow, identify key audiences to reach out to, choose appropriate and efficient methods and tools, assign the needed human and financial resources, and prepare supportive materials and information. This initial preparatory work increases internal capacity and thus represents a first step in the Infinity Loop of Engagement. In assessing their current capacity for Community Engagement and preparing for it, PSOs often realize that they lack some of the capacity, resources, skills and/or time they need for the amount and kind of engagement the agency needs and their community seeks. At this point, the organization might slow down, find additional internal resources, and/or seek help to increase its capacity for engagement, or they might plunge ahead and “do their best”, adjusting and learning over time. All of these responses can, again, increase the agency’s internal capacity. The input and ideas generated through these externally-oriented activities must then be taken into the PSO, summarized, analyzed (a sometimes complex and always critical task ), and integrated into its decisions and/or next steps and other activities. This internal step is essential for the engagement initiative to retain its integrity, for learning and momentum to be sustained, and for the organization to retain its credibility and trustworthiness. The work required here goes far beyond “reporting upwards”; the PSO needs to have robust internal conversations about how it can best learn from and respond to the suggestions, ideas, directions and opportunities the engagement process is catalyzing.This work of analysis and change also increases the internal capacity of the agency. During and after this process, the PSO must again shift its attention to outside the organization, in order to maintain communications with those who have engaged with the organization, reporting back on the activities completed and the input gathered. It must also, over time, communicate clearly the ways in which the engagement process and findings affected the decisions and the policies, programs, services, operations and/or partnerships of the PSO and the broader community. Meaningful engagement requires organizations to be open to change on an issue or initiative, and to embrace discussion and collaboration with others as a fundamental way of working. This applies both externally and internally. This openness means that leadership styles, decision-making processes, communication practices, and organizational and team structure will adapt and shift inside the PSO as a result of outside engagement activities. Therefore, undertaking high-quality Community Engagement helps an organization become what organizational guru Peter Senge calls a “Learning Organization”— one that supports ongoing experimentation, learning, innovation, and dissemination of new knowledge throughout the organization. The way the PSO comports itself in relation to a wider range of outside parties and audiences also shifts. In fact, the overall “culture” of the organization must shift in order to become more meaningfully collaborative around issues of shared concern. The process described above, though heavily simplified, shows the iterative nature of community engagement and related capacity building and social learning. The organization’s focus shifts from internal to external activities and back, building capacity at every step. Done well, community engagement sets in motion a positive feedback loop that strengthens capacity on both sides of the loop - external and internal. Both sides also see the outcomes of strong engagement: better decisions, more support for implementation, more responsive services/programs, more thoughtful policies, and stronger working relationships that are aligned around common causes. In short, the Infinity Loop of Engagement can bring significant benefits to all involved. See the upcoming MODUS article on “the key attributes and benefits of Community Engagement”. See, for example, Carolyn Lukensmeyer’s Public Deliberation: A Manager’s Guide to Community Engagement, with Lars Hasselblad Torres, IBM Center for the Business of Government, 2006, p. 46.